There are three steps to define the IP address for where the I/O modules are found. 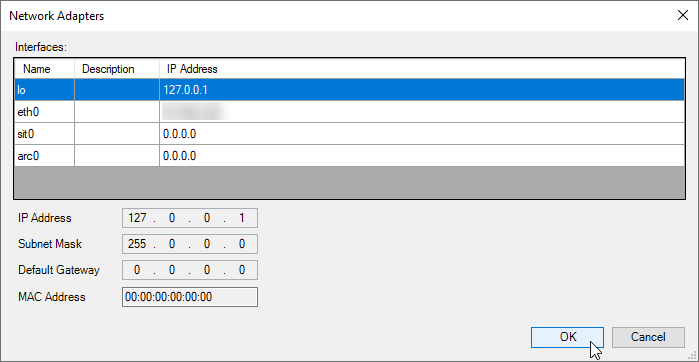 Note: Since they are on the same rack as the groov EPIC processor, the IP address is the loopback address, 127.0.0.1. 1. In the Devices Tree, double-click Ethernet (Ethernet), and click the General tab. A new Ethernet tab is added. 2. Click the ellipses ( ) button to open the Network Adapters window. Select the lo (local interface) with an IP address of 127.0.0.1, and click OK. The Ethernet Interface is defined. 3. Save your project by selecting File > Save Project. Steps to define the Ethernet IP Address for the I/O (Device).